Kirk Cousins was asked Wednesday about the toughest challenge the Vikings defense presents in the daily confines of training camp practices. Video (04:41) : Kirk Cousins spoke today about his excitement for Saturday's game against Denver, his respect for Case Keenum, and shared his thoughts on the offensive line that's in front of him. 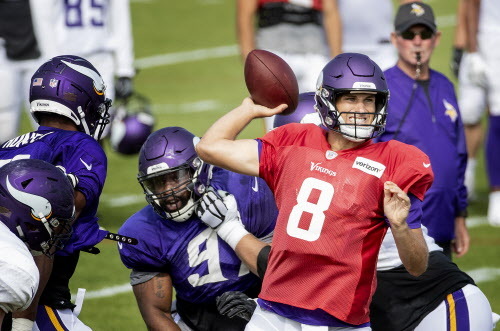 You’ve probably heard quarterback Kirk Cousins and the Vikings offense understandably remains a “work in progress.” Not helping matters is the NFL’s reigning No. 1 defense. Cousins was asked Wednesday about the toughest challenge the Vikings defense presents in the daily confines of training camp practices. His following tale was telling about a defense returning 10 of 11 starters from a year ago. Opponents from Aaron Rodgers to Peyton Manning have previously lauded the Vikings’ ability to disguise and/or change their pressure or coverage assignments on the fly. However, it’s becoming second nature even when they’re not supposed to, according to Cousins. “I went over to coach Zimmer afterward and said ‘Tell me a little bit about what is going on there,'” Cousins continued. “And he said well they’re not supposed to do that. They were supposed to leave the play on, but they’ve been playing together for so long. They’re so dialed in that even if the play clock is running down or you’re getting your check out quickly, they know with one hand signal or one word, everyone knows what to do. I think that’s the hard part. Because that’s — when you have a brand new quarterback and brand new offensive coordinator — we can’t say the same thing on offense.